Bugs that eat books aren't injurious to humans, but they can destroy your library. Book-eating insects inhabit books in their larval stage, eating collagen glues, cotton, leather, linen and paper. These insects can be difficult to spot because of their small sizes and hiding instincts. Use a magnifying glass to inspect volumes for intruders. There are five types of bugs that commonly infest books. 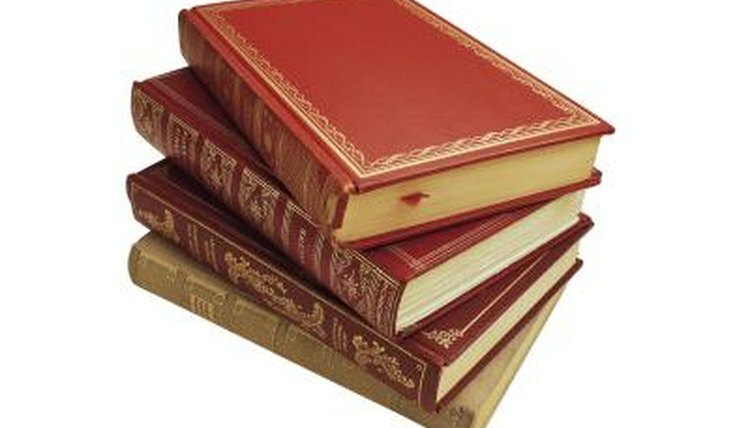 Book lice are not true lice but are lice-like in appearance. They're so small that they look like specks. Book lice are pale and cylindrical wingless insects, with swollen abdomens. They inhabit damp and moldy books, eating the molds and fungi. They don't bite, spread disease or cause damage, but they do multiply and quickly become an annoyance. Carpet beetles live most of their lives as larvae, grazing the surface of your book's pages and fabric binding. You may find casings, with several long hairs attached to the ends, left in the pages after the larvae have molted. Sometimes faint trails can be seen on the page surfaces. Cigarette beetles also infest books during their larval stage, creating tunnels and holes as they burrow in the book's pages and bindings. Cockroaches are extremely destructive to books. They eat cardboard, paper, fabric, glue, leather and mold. Cockroach larvae will stain your books and leave egg casings between the pages. The skin that's shed by cockroaches can trigger allergies and asthma attacks in many people. Silverfish are wingless bugs with a powdery silver coating. They have long antennae and three long, bristly hairs attached to their tail-end. Silverfish live in dark, humid places. They will eat cotton and linen bindings, glue and paper. A silverfish invasion can also ruin your collection of best-sellers. Inspect your books for signs of insect damage. Signs of book-eating bugs include live or dead insects, wings, skin casings shed by molting larvae, egg cases, excrement and holes or tunnels in the pages. Wrap infested books in a towel and place them in sealed plastic bags, then put them in the freezer at 22 degrees below zero Fahrenheit for at least a week. Remove the books and re-inspect them. Repeat the freezer treatment if you still see signs of bug infestation. Store your books in a clean, cool and dry environment.